I’ve seen the Toronto Blue Jays (baseball) and the New York Giants (USA football) as well as Manchester United over many years but I had never been to a cricket match. So when we had the chance to go and watch a Nat West T20 Blast at Old Trafford I was not the most excited person in the house. My two boys, aged 7 and 12, both play cricket as does my husband and were totally game on! Having two sport loving boys and a husband, I’ve had little choice but to swept away on the current of bats, balls and matches, having to attend events, more than actually wanting too. However, I have to admit that over the years I have come to enjoy them more and more. Approaching Emirates Old Trafford I remembered why sporting events are great fun, I just love the atmosphere outside the ground, with mouthy ticket touts, police, bumper to bumper traffic, the smell of fast food, the families all together, the excitement in the air – it all adds to the build-up. After collecting our tickets and easily finding seats in the shade, I started to ask my husband lots of potentially annoying questions; what is a power play? Is it called ‘blast’ because of the blasts of pop music? What does a blast of ‘High Ho’ with a bell mean? Why are they all in red? Is there an interval? How many balls in each over? The pace is fast and the players can’t half sprint, throw fast and accurately, blink and you’d miss it! There were several sixes hit high into the air, with accompanying ‘oooohs’ and ‘aaaahs’ from the crowd. One spectacular shot hit the upper tier of the stand above our heads and was caught by a very happy man a few rows in front of us. Lots of action in the form of fours and sixes, with many high and heart stopping catches. It was then I thought, yes, cricket can be exciting and entertaining. I did notice the music for the opposing team when the batsmen were out was a little harsher than when Lancashire were out, ‘Bye Bye Baby’ and ‘Another One Bites the Dust’ – I even felt sorry for Durham as they sprinted back to the Pavilion in time to the beat! 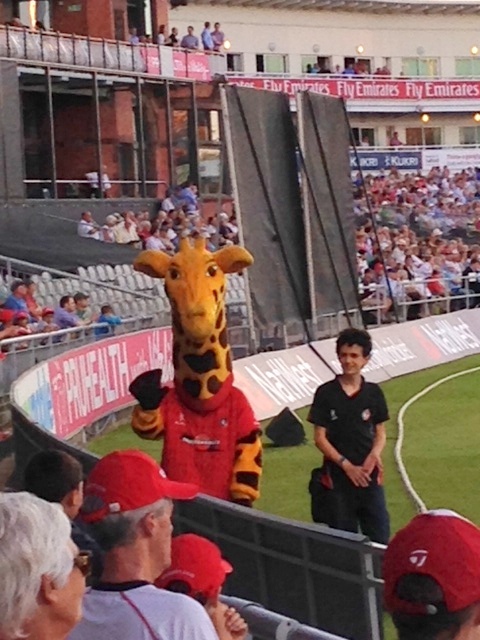 Lanky the Mascot made his way round the ground waving hello and giving a high five to some children. He also had a little dance, odd but fun, a giraffe mascot dancing along to the Spice Girls (Lanky short for Lancashire, giraffes are lanky, in case you were wondering). Now for the boring bit, which families like mine notice and can make or break a day out if done badly – Very nice toilets, clean, cool and big and lots of them. Loads of bar staff and no big queues, with lots of parking in and around the ground and efficient and smiling staff everywhere; all the stuff you need when you have children in tow– well done Emirates Old Trafford! Is cricket for posh people and public school boys? Definitely not. 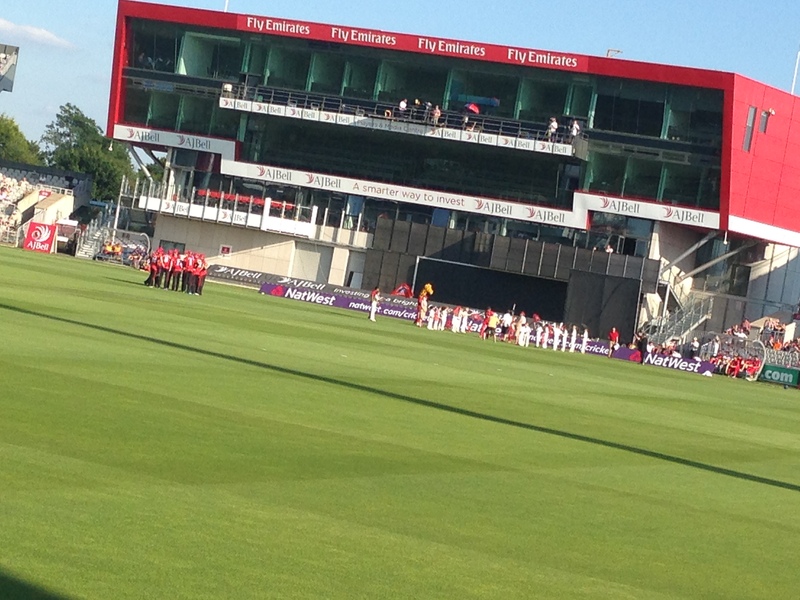 Emirates Old Trafford and Nat West T20 Blast have a slick, efficient family friendly set up, with a whole family fun area outside the pitch with bouncy castle, bands, music and souvenirs (see plastic Lanky mascot image £2). The free Emirates baseball caps; which my husband thought made them look like Arsenal fans (he is a HUGE Man Utd fan) were a big hit and my boys loved them. Even if you don’t like sport, let alone cricket I’d urge you to go, it’s fun, different, exciting and a glorious way to spend a hot summer’s evening, they even do a great glass of rosé. 84 – 1 Lancashire batting. There were many children and families of all ages, from about 3 upwards, and they get to move and dance about, cheer, whoop, clap and holler, so no sitting still required! As my 7 year said at half time “I love this disco cricket!” To top the evening Lancashire Lightening won the game and finished top of the T20 Blast group, winning by 27 runs (which my husband tells me is a good result). One thing I would say, it trying to book tickets is a cumbersome process, there is nothing on any sites that just tell you how much tickets start from without having to go through and long slow booking process, so even now I still can’t tell you how much child tickets start from, I think it is £12 or free, I can’t be 100% sure without another 15 minutes of web surfing. 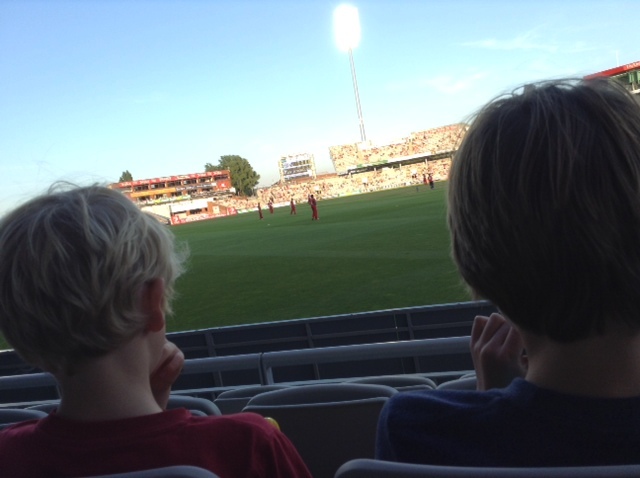 If Nat West T20 Blast and cricket venues across the county want to attract more families, clear prices, easy to book and maybe a family ticket/package would be the way to go, which they probably already do but I could not find the details anywhere! So I will ask and post a link ASAP. According to my son’s the catches were the most impressive thing of the night and as we speak, both are out in the back garden practicing catches with a softer, training cricket ball. You can pick up a cricket starter set in most sports shops for about a £10-£15 making it a low cost sport to start to play. 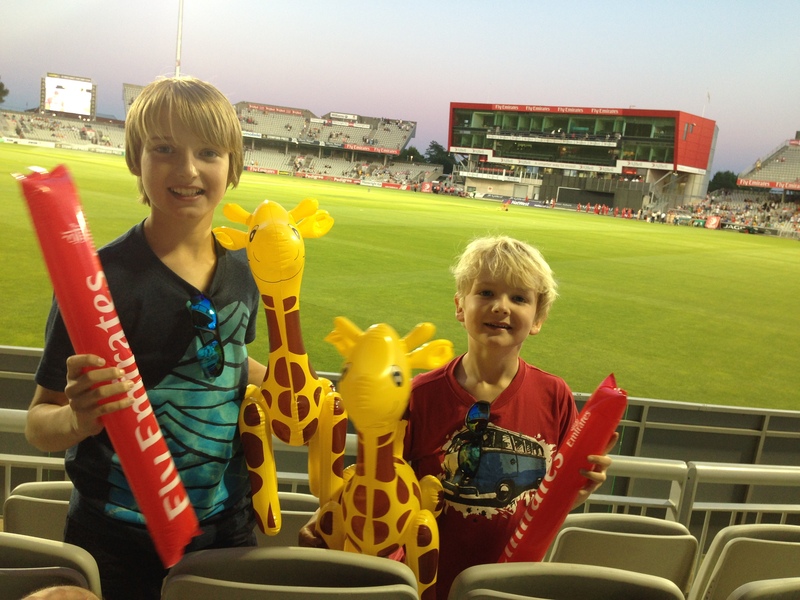 I love the fact my children have been inspired and excited by attending a Nat West T20 Blast. School summer holidays, sunshine and cricket; happy days. 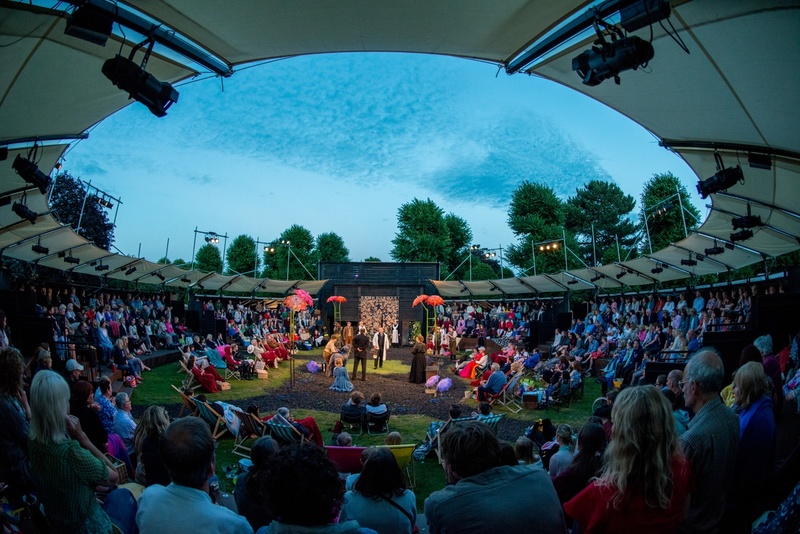 A temporary theatre in a park, with walls and no roof? My seven year old was confused and could not quite imagine the scene at Grosvenor Open Air Theatre in Chester. My eldest son who is 12 has been to quite a varied mix of productions and is very interested in behind the scenes and how it is all put together. Thank goodness you are told to bring cushions to sit on and hats because the sun was baking as we waited to enter, if you forget you can rent cushions and even get a squirt of sun cream from the happy and helpful staff that come round offering it with a smile. 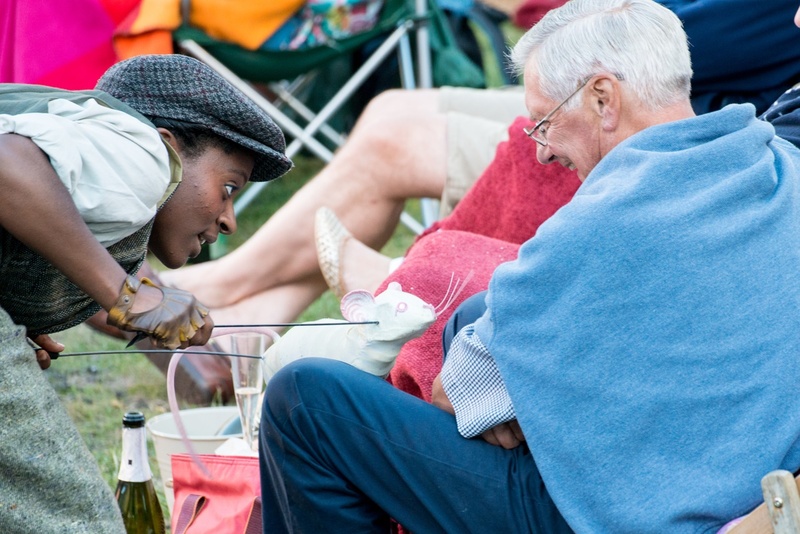 Anything ‘open air’ brings a delightful array of picnics and food, smoked salmon with lemon wedges beautifully arrange on a plate, strawberry cheesecake, many corks a popping to a few packets of ready-made sandwiches; each to their own and why not! As the first main character came bustling on in her burnt orange silk evening gown, everyone went quiet and it all began apace. After a very moving earthquake scene where Mary Lennox’s parents die and Mary is found in the debris, she is then whisked off to England without care or explanation. Beautifully played by Jessica Clark, Mary strikes a delicate balance between sadness, fright and hostility. Eventually after many seemingly futile attempts by maid Martha (Kathryn Delaney) to break through Mary’s defiant exterior they become friends of sorts, enough to keep them in sync with each other through shared secrets and the need they both have to break out of their allotted path in life. My eldest learned over and whispered ‘why are they all being so mean to Mary, she’s done nothing wrong?’ I had to totally agree with him. Even in the hot afternoon heat and bright sunshine you could feel the cold and despair of Misselthwaite Manor and its inhabitants, locked and forgotten in the grip of grief like the Secret Garden Mary eventually discovers. 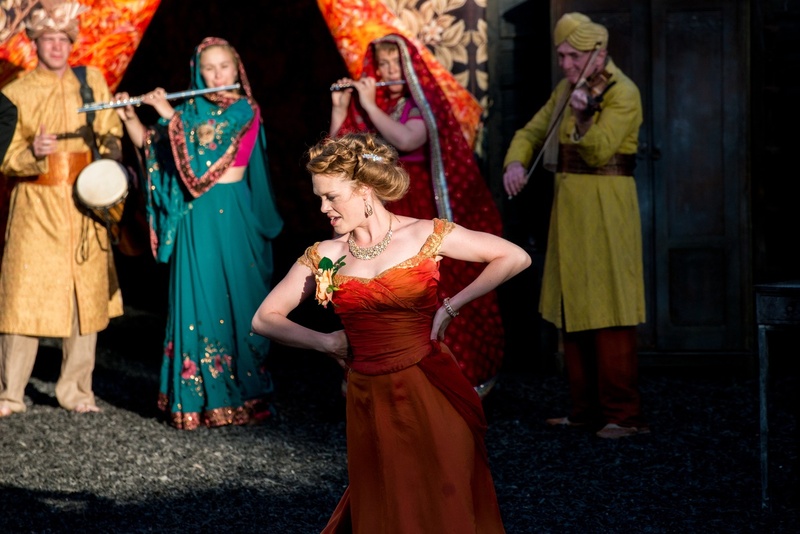 With various delicate instruments adding not only soundtrack but story, played by the actors mesmerizing the audience and even a couple of visiting wood pigeons settling on the lighting rigging for what seemed like most of the second half. When Mary stands up to Mrs Medlock (Heather Phoenix) you could hear her shout not only for the Archibald Craven (Mark Healy) but for herself after years of not being heard or listened too. When they all see the fruits of her labours not only with the boy and the garden, I did not know whether to whoop and holler at her success or weep at her courage and ferocity of voice. All I can say is that my sunglasses hid the tear or two that welled up. The verdict of my children? Not only did they find the story sad and triumphant, but were fascinated that one person could play many characters in the same play with different lines and costume; how on earth did they remember, know what to do and be two or three people? All the cast were just superb and in one single afternoon showcased to many children like mine the true joy of theatre, acting and being part of a wonderful production. Thankfully the Victorian attitude of children being seen and not heard is long gone, but I have a note ripped from a magazine on my fridge that says ‘Listen earnestly to anything your children want to tell you. If you don’t listen eagerly to the little stuff when they are little they won’t tell you the big stuff when they are big, because to them it has always been big stuff”. The puppets, especially the Bloodhound dog are so real, with gentle, subtle movement and eyes that sparkled in the sun were and cleverly handled, making even more magic seep through the performance. The little red robin was so charming and delightful next to the Yorkshire funny gruff of the Head Gardener. The entire afternoon was a delight from start to finish and both my children now know what a roofless theatre in a park is all about! Full details and ticket information can be found here. More shows have been added, not to be missed! All photos by Mark McNulty. 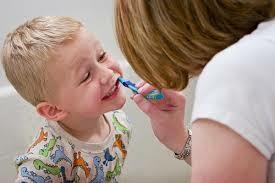 Children, the dentist and brushing teeth! Deborah Royan, the patient Care Co-ordinator and qualified Dental Nurse from 32 Whites shares her experiences on children’s oral health and gives some top tips on how to ensure your child looks after their teeth. With high sugar diets and a surprising amount of children not being registered at the dentist, we are seeing increasing numbers of children with decaying teeth. Deborah explains: Unfortunately we have met young children with holes in their teeth, complaining of toothache. The solution is for them is to have fillings in their milk teeth but our job is to educate children and their parents to ensure that this can be avoided in the first place. Taking your child to the dentist for the first time can be a nerve wracking experience for everyone. Especially if the parents have their own phobia of going to the dentist, children may pick up on this and have an issue with it too. Our advice is to make sure you take your child to the dentist when their first milk teeth start to appear. Early visits really help with their confidence and help children to get used to the surroundings. Whilst they are getting used to the environment of the dental practice it is also a good opportunity for your child to get to know the dentist. 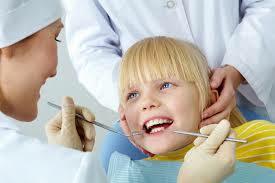 You can also encourage your child to accompany you on your appointments so they visit the practice more regularly. Parents should make visiting the dentist a positive experience. When they are very little we encourage children to sit on their parent’s knee and as they get older we make sitting in the dentist’s chair fun. By starting appointments as soon as possible, the dentist can help to prevent early decay and identify any problems at an early stage. We talk to parents and children about how to look after their teeth and also think about their diet and the impact this can have. Obvious foods like sweets, biscuits and fizzy drinks should be avoided but there is also hidden high sugar content in dried fruit, cereals and even fruit juice. Providing your child with a good cleaning routine and educating them about their oral hygiene and health is the best start you can provide for them, Deborah concludes. It will also help them look after their adult teeth when they grow up, ensuring they maintain a happy and confident smile.